The only thing we love more than a nice handbag is getting a deal on a nice handbag. But it's so easy to be scammed! Counterfeit purses are tempting, but the truth is they're illegal, cheaply made, and a waste of money. 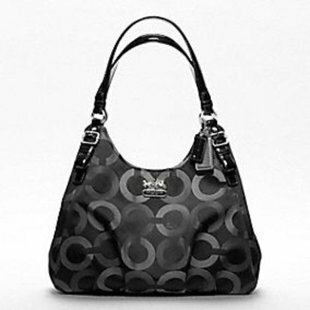 And while Coach bags are currently the world's most popular handbags, they're also the most-imitated. So how can you tell real from faux? We spoke with the experts at CouponCodes4u.com, the leading coupon code websites in the US, on how to spot a knockoff. They're experts deal hunters and they work closely with major retailers like Nordstrom so they know how to find a legit purse at a great price. Here are their six tips to avoid falling for designer imposter bags. Spotting replica handbags used to be simple; check the hardware, logos and material. Lightweight metal accents, slightly skewed logos and cheap materials are still the first lines of defense for warding off fakes, but with today's higher-quality knockoffs, it's a case of needing steps two through six as well. Know the signs to look for in the specific bag. For instance, Marc Jacobs' zippers are embossed with either RiRi or Lampo and all Louis Vuitton bags made since the early '80s have a date stamped somewhere on the interior. Brand fanatics spend time spotting knock-off bags to protect their favorite designers' integrity, so a quick search before you buy will reveal specific tells for each high-end brand. When buying a handbag online, make sure it's from a reputable source. If sites are based in China, specifically Hong Kong, proceed with caution, as the country makes up 88.8 percent of the goods seized for Intellectual Property Rights by the ACG. Also, check the descriptions and reviews for signs of inauthenticity. If customer reviews say the bags aren't the real thing, then they likely aren't. Just because a bag is sold online, it doesn't mean it's fake. Authentic and vintage handbags are often sold on eBay; buyers just need to be smart in researching the seller. If the deal looks too good to be true, it usually is. A Chanel bag will never be $50, so use common sense. Certified resale sites also offer discounts on authentic bags. A Burberry or Prada handbag will not have crooked stitching or unfinished edges. High-end brands take ultimate pride in craftsmanship, so no imperfect bag would leave their factory for a legitimate retailer. The leathers and fabrics of authentic bags will always be perfectly stitched and lined up, never crooked or gapped stitched. Before you spend big money on a big brand, make sure to check out the designer's website and/or retail store to make sure the styles you're looking at even exist. The only noticeable differences in some high-end imposters are styles and colors that were never made by the particular designer. If you've never seen a zebra Hermes Birkin bag on a celebrity, then it was probably never produced. These tips should help you find great deals and avoid crummy knockoffs. If you can't afford the real deal, an authentic, quality purse from a lesser-known brand is better than fake leatherette Gucci bag that falls apart. Really. These types of present different benefits to women and not simply fashion privileges alone. Celine Bag offer protection and safety for that essentials a woman bears.